Thank you for the feedback and input. I will do my best to include as much as possible. At the moment, I am still writing material for late 2013. It is an extremely time consuming process. I will hopefully post an updated PDF tonight. Further work has been done today. I have uploaded the current state of progress so far. I will draft pages for 2014 and 2015 during next week. I have been working on chapter 6 “Peerunity Wallet Client Released” today. Chapters 1-6 cover Peercoin history from 10th August 2012 to 21st July 2014. Most pages are still in draft format until as much history as possible had been accounted for. I am see some bugs, I think. For example, the page numbers start with 32. On page 9 of the pdf (labeled page 49) there is text off to the right where it can’t be read. Most pages from then on have text off in the margins somewhere that can’t be read. Is this an issue with my pdf reader, or an issue with the pdf? The broken text is url links added to the sides of the MS publisher pages. Nothing to worry about. The history chapters start at page 32. There will be introductory pages from 1-32. Peercoin has uncapped inflation while most other coins are based on fixed supply. Still, our rate of inflation tends to be better than coins like Bitcoin at the present, and we believe inflation to be useful economically long-term (https://www.peercoinexplorer.net/inflation/ and https://twitter.com/peercoininflbot?lang=en). Peercoin’s economic model in general is a very interesting point. 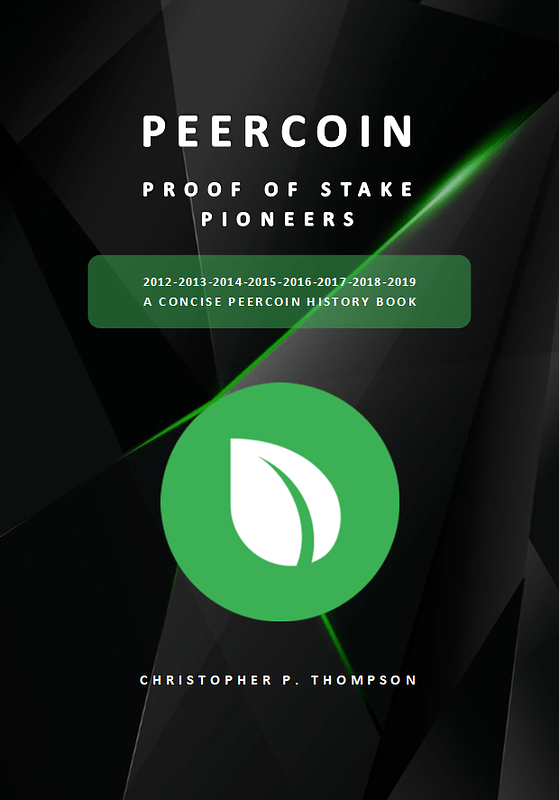 I realize this is a history book, but this model is historically unprecidented in the cryptospace, and is one of the things that makes peercoin stand out. For example, burning our fees rather than recycling them back to the miners, such that we are the first chain to require a minimum fee per unit data added to the chain. Under a similar heading, Peercoin was the first to implement a minimum dust size for outputs, a feature that was later adopted by Bitcoin in 0.8.2 (https://github.com/bitcoin/bitcoin/blob/master/doc/release-notes/release-notes-0.8.2.md). I am looking for more on Peercoin as the first chain that was actually verified by decentralized PoS, and all the forks (both literal and intellectual) that came off of it. It is the number one biggest thing that makes Peercoin stand apart, and we believe its implementation to be the most straightforward, given its compatibility with Bitcoin protocol. I guess in general I am hoping for more of what makes Peercoin historically relevant, rather than simply a timeline. I realize this can be difficult, especially without being a part of the environment at the time, but I’m sure everyone here will be happy to provide you with more background if you ask. It is a significantly different take, and is mostly about trying to build layers on top of the core network, but some of it may be relevant for your later chapters. I have made more progress on the book (see attachment above). I will take on board what Otzi and Nagalim said. There will be 30 pages before the history chapters (1-17) for detailed material. @Tyke wants to withdraw 50% of what has been donated so far. If nobody has objections I’ll sign the transaction to transfer 1500 Peercoin to his address today.